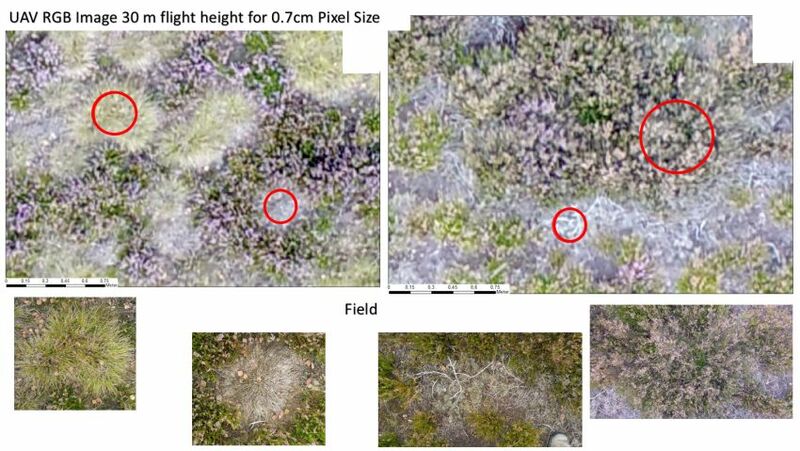 During the maximum flowering period of Calluna vulgaris, several UAV Images were recorded on different heights from Test Field A. It gives a fascinating insight into the diversity of colors of the flowering heather. 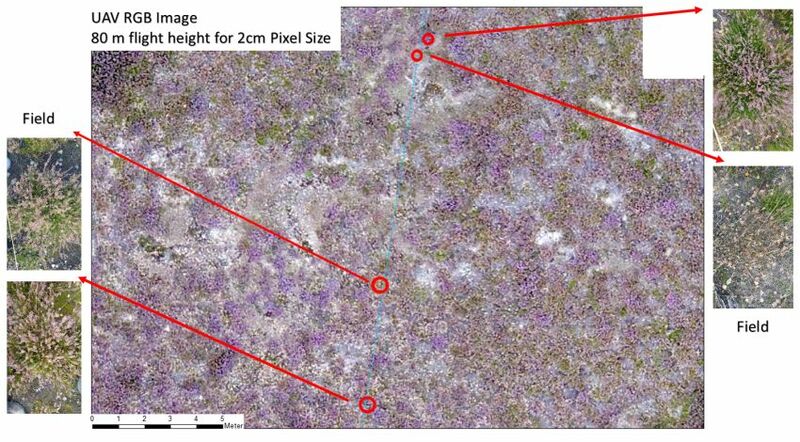 An image for the complete area of the size of 10 ha can be saved within an overflight time of 30 minutes on many pictures that will subsequently be merged to a whole image mosaic. The final mosaic images could then be used in a timely manner to find the depicted plants in the area with exact coordinate locations and describe them with regard to species and vegetation structure. We mapped the colors of flowers and shoots, the plant height, the amount of dead wood and the number of buds, fruits and vegetative shoots on selected individual plants and along transects. In addition, all other site features in the entire area were determined to characterize different habitat properties (soil color, proportion of grass, lichens height and type, moss type, etc.). Even the real color images alone provide an interesting insight into the Calluna habitat diversity. With a pixel size of 2 cm, the color of the flowers, the mosses, the deadwood and the age (fresh-green, old-brown) can be recognized with the naked eye. Thus, full inflorescences in purple alternate with already withered phases in a delicate pink, infused with brown moss rugs or ingrown grasses. Each plant is individually distinguishable from a mix of colors. In between, areas of raw soil, grasses, mosses and lichens emerge. Understanding the organization of this diversity is our challenge. Research will now transfer the knowledge gained from the field surveys into algorithms that can be used to better characterize the habitat type of the European Dry Heath based on the different phases of phenology. 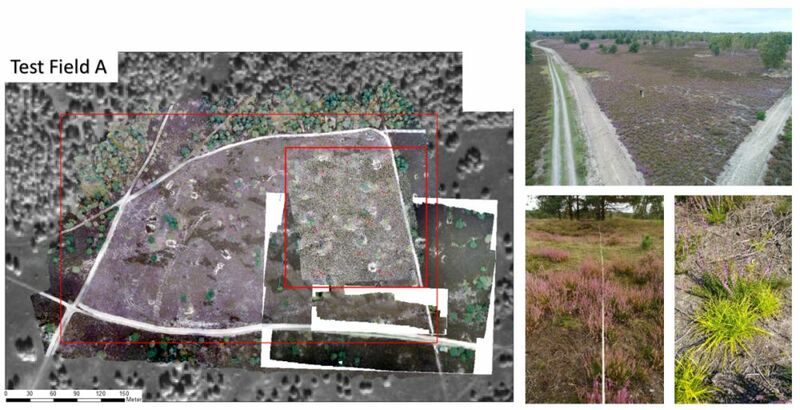 For the first time, remote sensing is enabled to capture plants and other habitat characteristics with a sub-centimeter resolution by the use of drones from the air. By this means, even small branches and twigs, as well as single leaves can be described on images. The composition and conservation status of individual habitats can thus be assessed directly by species and status indicators. It provides deeper insights into the underlying ecology of processes that define and control a certain habitat type. The GFZ research partner is now trying to model individual habitat characteristics, quantify habitat parameters and predict them over a complete image mosaic. This should also benefit the automated habitat management devices, as even small pieces of metal, stones and trees can be automatically identified from the recorded images. Such information can be used to localize and mark obstacles on a map produced for the mowing machine that will be developed in the project. Learn more about digital image analysis here.